What are the different types of RO water purifiers available in India? There are mainly two different types of Reverse Osmosis RO water purifiers available in India: The wall mounted RO water purifier and the under sink RO water purifier. The wall mounted RO water purifier is the most popular type of water purifier in India even though the Under Sink type RO water purifier is the most popular type of water purifier in the USA, UK, Dubai and other advanced countries. 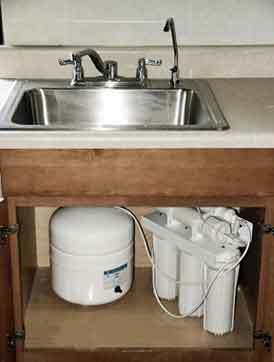 Pictures of these two types of RO water purifiers are shown below. Both are storage type RO water purifiers since they have a storage tank for purified water, and purified water will be available even when there is no electric power in the house. Under sink RO water purifiers in India are just getting popular. Under sink ROs are fitted in the kitchen cabinet under the kitchen sink. The pure RO water faucet is fixed next to the kitchen tap as shown in the picture on the top left. Under sink RO water purifiers are fitted with an air pressurized bladder RO water storage tank of about 5 litres. Even if there is no electricity, 5 liters of RO water will be available from the special pressurised RO water tank kept under the sink. An under sink RO water purifier is the best water purifier for kitchen faucet because it sits under the kitchen sink hidden from view and RO purified water comes out of a faucet on the kitchen sink. Any water spillage from the faucet will not be a problem because it just drains down the sink. Under sink type RO water purifier is the best kitchen sink water purifier. 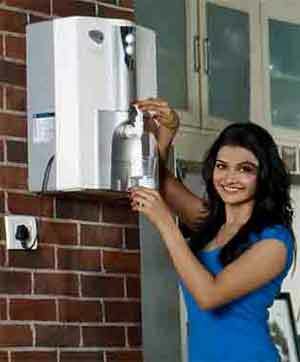 Wall mount RO water purifier is the more popular type of RO water purifier in India. It can also be kept on top of the counter. The picture on the right shows a typical wall mounted reverse osmosis type water purifier in India. Wall mount RO purifiers have inbuilt RO water storage tank of about 5 liters. These tanks are provided to give purified RO water even when there is no electricity. Both types of RO water purifiers, wall mount or under sink, gives very good water. So the question as to which RO water purifier is the best depends on the place you have for installing a RO water purifier. When there are fitted kitchen cabinets it is more convenient to have an under sink RO water purifier because it stays out of sight with the convenience of a facet on the sink next to the kitchen tap. You can keep bottles to be filled with purified RO water on the kitchen sink and just keep the faucet open till the bottle fills. You need not hold the bottle to fill like with a wall mount RO water purifier. Also since the under sink RO water purifier has a pressurised tank, the water comes out with more force and bottles can be filled quicker. The advantage of RO or Reverse Osmosis water filter is that it will remove not only all the germs including the smallest viruses, but will also remove harmful chemicals like Arsenic, heavy metals, Nitrates, Salts, etc. In fact bottled water manufacturers use RO to purify the water before they bottle it. Reverse Osmosis or RO water purifiers are much better than Ultra Violet or UV water purifiers because an RO membrane filters out all the germs and parasites in the water. In addition it removes all toxic chemicals like heavy metals and harmful salts from the water. A UV purifier on the other hand just has a powerful light inside which sends out UV radiation to kill any germs and parasites. The bodies of these dead germs remain in the water you drink. UV light inside UV water purifiers can get blocked when scale forms on the UV bulb, due to heat from the bulb. The scaling problem is intensified when UV unit is 'on' and the water outlet kept 'off', which means there is no flow of water through it. If the UV bulb is kept 'off ' during no-flow, then bio-growth like algae or slime forming on the glass around UV bulb will block the UV rays. Therefore either 'on' or 'off', UV can become ineffective after some time. So to the question water purifier RO vs UV, without any doubt RO is better than UV water purifiers. The disadvantages of RO are that it requires high water pressure and that some water is wasted in the reject stream. If there is not enough pressure in your pipeline then a small electric motor is required to pump the water to a high pressure. Secondly, it wastes some water in its reject stream which carries all the concentrated impurities that was there in the water originally. This means that when it purifies say 1 liter of water, it drains away about two liters of water, in which all the impurities are concentrated. This waste water is known as the reject. To collect the reject water of an RO purifier all it requires is for the small drain tube of the RO to be put into a bucket instead of into the drain. The reject water can be used for cleaning or watering plants. Not all water is passed through the RO membrane pore in a RO water purifier, only about 50% of the dirty water is allowed to pass through the RO membrane as pure water. The balance 50% of the water is flowing over the surface of the membrane continuously and is rejected or thrown out. The impurities remain in this reject RO water that is thrown out into the drain. The quantity of water wasted or rejected by an RO water purifier will be, on an average, about the same as the quantity of purified RO drinking water you use. The incoming raw water into an RO water Purifier is divided into 2 equal streams, 50% goes through the RO membrane as purified water and the other 50% does not go through the membrane, but collects all the impurities that was there in the incoming water and is thrown out into the drain. It is possible to collect this water in a bucket or other vessels, if you want to be so careful so as not to waste water. The maximum amount of drinking water that a household of 2 adults and two children uses is about 20 liters per day. So you waste about the same 20 liters of water per day, which is about the same quantity of water used when you flush the toilet 2 to 3 times.